“Turning and turning in the widening gyre” is an appropriate last chapter for a book that is an amazing picture of the wheels of global capitalism as it lifts some and crushes others over centuries, continuously depleting “the reservoirs of human energy” and “the limited treasures of a wasting planet”. 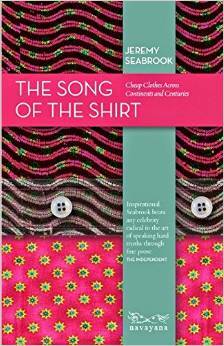 Jeremy Seabrooke’s book is named after Thomas Hood’s poem about workers in 19th Century Manchester called “The Song of the Shirt”. It is remarkably conceived, well researched, and pays homage to the poem it is named after by laying out the predicament of the non-privileged in lyrical prose. The book is vast in its coverage and has many universal themes. It goes over the economic histories of Dhaka, Murshidabad and Kolkata – diligently detailed from many sources. It traces the rise of weaving, of textile exports from Bengal and goes full circle from the industrialization in Manchester with deindustrialization in Bengal to the contemporary deindustrialization in Manchester and the industrialization of Bangladesh (Dhaka in particular). Every sentence is woven with a compassion and detail that would put any academic to shame. And yet, the lens that he wears to view Bengal is wider than that of any social scientist studying development – one might note that Bangladesh is perhaps the most written about place in the “development literature”. In the first sections of the book, he goes over garments factories in Dhaka and those who work there – recent migrants who believe they are there temporarily and will earn enough to make a difference for their families. The multiple sources of vulnerability these workers face include fatal fires and Seabrooke covers the Tazreen fire and provides statistics on accidents in garment factories. He repeats several times that that doors of garment factories are kept shut to avoid pilfering. This parallels with guards who used to be posted outside the doors of weavers when the East India Company conscripted such textile weavers in Bengal to produce for the exporting monopoly. These types of parallels are made throughout the book, allowing us to anchor our sense of time and place in the larger scheme of things. He looks at contemporary Bangladesh, the rising inequality facilitated by the discrepancy between profits and wages in the garments sector, and describes the fortressed lifestyles of the elite. He elaborates on how the workers migrate, live, and work, never forgetting where they come from. He remembers that people in Bangladesh have always seen their homes washed away and built new ones but he also keeps in mind that Bengal had attained a level of industrial proficiency that threatened the rise of textiles in England. He comments on the distance between owners and workers kept in place by the social order in Bangladesh, which distinguishes classes of people such as the Ashraf and the Atraf. However, he fails to mention similar distances by race or nationality that operate in the West in contemporary times and forgets the role of immigrants in recent textile production in industrialized countries. Naila Kabeer’s book The Power to Choose is important in that regard. In addition, he refers to the Rana Plaza garment factory that collapsed in 2014 as an “unregulated” workspace. While it is true that the factory did not meet safety regulations, this factory is an example of what would be called a formal workplace in Bangladesh, as contrasted to the sea of informal makeshift sewing operations that occur in cramped spaces designated for residences or take place in the homes of women. In chapter 11, he covers the Rana Plaza incident and the complicity of the government with garment owners rather than workers after it had occurred. How were we to understand this horrific incident? He compares it with accidents in Wales or the Triangle Shirt Factory in New York and reminds us that if we think that such incidents are “100 years behind us” in the West, then we can also believe that some day it will no longer take place in Bangladesh. The way to forge ahead, then, is to continue to produce garments in the same manner and carry on business as usual – he calls this a “pleasing” theory of development. It is both pleasing to the West who are forever ahead of the “developing world” and pleasing to the elite in Bangladesh who say that one day the workers will get their due but now the income that has accrued from growth and development may belong to the garment owners and give them an incentive to expand the sector and its employment. Garment workers of course are not passive, and Seabrooke goes over their rage and attempts and resistance in a chapter called “unrest”. In a few mentionable chapters on Amanathganj, Barisal, he goes over the migration of workers to urban areas, the loss of their land to the powerful – men or rivers, their dreams of the luxuries of modern life, now reaching them through TV screens that “diminish… their mockingly frugal lives” through “the shadow of glamour that it throws upon them”. He catalogs a variety of circumstances that migrants have come from or must contend with, going over their costs of living and incomes to show us how existence must be eked out under a tarp or in one room of concrete shared by ten people. He recognizes that local goods are cheaper to subsist on and notes that most people can only afford local bananas and must make do with thinned out daal water on their rice, and that purchasing relatively expensive apples, oranges, and milk are out of question. One man talks about hunger as being of two types – the first is pangs of hunger when you have no food at all and the second is undernourishment over a long time. Rickshaw pullers “pedal away their youth” and we see them “old at forty with their heartbeat visible and captive under a thin ribcage”. On the topic of nationalism, while watching a performance/play about the 1971 Liberation War that also recalls partition, he asks why there are no plays about the suffering of present times. Absent here is an understanding of the need for a modern national identity. He provides a rich account many of the past and traditions that Bengalis are grounded in, but appears to not fully appreciate the hope and dreams they hold, no matter how hopeless others consider them to be. He then goes over the fall of Dacca’s weaving industry, noting how tariffs placed by colonial administration discriminated textiles in particular. One may note that the UK now provides Generalized System of Prefereces (GSP) tariffs to Bangladesh textiles in a complete turnaround from that trade policy of the past. Seabrooke sets the reader straight on the stories of how weavers did not have their thumbs cut during this period. This is a common myth in Bangladesh. He notes that deindustrialization in Bengal came with indigo, jute, and opium plantations. We may note that old deindustrialization did not leave the same waste as it does today – miles of concrete wasteland that can be seen in the Midwest of the US, depletion of natural resources, or contamination of water and soil. In early capitalism, industries were less capital intensive and therefore less natural resource intensive as well and did not leave behind the same dystopic landscape as it does today. Worth mention are the details of the complexity of spinning of the special threads in Bengal, the times that such spinning could be done, the types of Muslin fabric, and the wonder that the textile craft used to be before mechanized spinning or weaving mills created standardized thread and fabric. It is a recalling of the time when labor had dignity and made clothes without being at the servitude of capital. Also, an entire economic history of Dhaka, Murshidabad, and to some extent Kolkata is contained in this section where he goes over the three declines of Dhaka in 1704 when the capital shifts to Murshidabad, late 1700s when weavers are dispossessed with the end of Mughal, and finally in 1947. He also describes the heart wrenching famine of the 18th Century and the depopulation of Murshidabad. This long economic view of Bengal alone makes this book a worthy read. While he states in p. 158 that “economic violence has lapsed in the modern world”, the strong case he makes for the hapless prospects of “informal sector” businesses on which the development industry now rests its hopes, the mono-industrial nature of the readymade garments sector, and the transient nature of work in garments all show that workers who have been completely stripped of the ownership of their products and do not even identify with their calling, perhaps suffer as much economic violence as their brethren in the 19th Century Manchester that appalled Friedrich Engels or the “smashed” pleasure seekers in post-industrial Lancashire. Farida Khan is Professor of Economic at University of Wisconsin – Parkside. Farida Apa, this is beautiful! Excellent review. Haven’t read the book, though. Want to read it now. Thank you Farida for this write up. Although I have not read the book but from your review it seems that the book covers quite a bit about the historical textiles industry of Bengal. During 2011-2013 I delivered a project in London called How Villages and Towns in Bengal Dressed London Ladies in the 17th, 18th and early 19th Centuries, which involved recreating historical costumes stored in British heritage institutions, such as museums, that ladies in London wore made from textiles that came from Bengal. I was astonished when I started to find out about the variety of textiles that Bengal produced, centred on the Dhaka region, and as my knowledge grew on the topic my pride and admiration for the achievements of our people in the past increased day by day. I know life was not easy for the poor weaver who wove those beautiful, intricate and sought after fabrics, as is usually the case because most of the benefits and enjoyment are experienced by people with money and power, but the role of Bengal in quality historical textile is truly amazing. I feel currently, in terms of facts and details, not much is known about the historical textiles of Bengal, the variety, the exports, etc. The project that I worked in recreated 23 items and produced a book called Bengal to Britain. Details can be seen http://www.stepney.org.uk. The recreated garments will form part of an exhibition by DRIK on Bengal Muslin to take place later in 2015 at the National Museum of Bangladesh.